Cutting down trees and sectioning them into logs is only half the battle. How on earth do you turn them into more manageable chunks? Log splitters exist to help you cut logs down the middle into halves and quarters. This makes them ideal for use as firewood, and many woodworkers also benefit from this as it helps reduce the size of the log when they are making small items. From the old-fashioned method of axes and metal kindling splitters to modern gas and electric models, there is a lot of variety in the products available for splitting wood. Luckily, we have done some of the research for you to bring you this guide to how you can find the best log splitter. Related: Best Chipper Shredders Review. View the Best Log Splitter For The Money, Below. How do you use a Log Splitter? How does a Log Splitter Work? 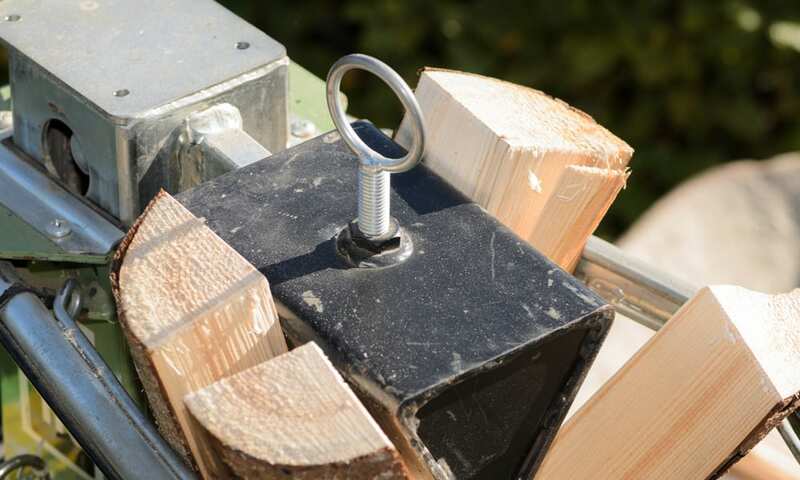 We consulted experts, bloggers and customer reviews to bring you this list of the top 10 log splitters available to buy online. This log splitter has been awarded Amazon's Choice for electric wood splitter thanks to the excellent reviews and high-quality manufacturing. It works by inserting a log onto the machine and allowing it to push the log onto the splitter. It operates very quickly on a variety of log sizes and thicknesses and even comes with a four-way splitter attachment to make your job easier on larger logs. It has seven tons of force behind it, allowing it to work through even the toughest of logs. The electric motor has two horsepower - one of the most powerful on the market. Boss Industrial are so confident in the quality of the machine that they provide a two-year warranty with it - protecting you against any potential damages. It is very easy to work and can easily be operated with one hand. See more information on Boss Industrial ES7T20. 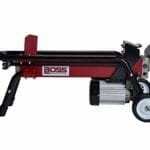 This is a great entry level log splitter and will help you with most logs you are likely to encounter for household and woodworking purposes. The two-year warranty is a fantastic addition, guaranteeing you will get good use out of the machine. This log splitter comes with a whopping 25-tonne horsepower force behind it - larger than most conventional machines. This makes it great for very thick and tough logs, making this an ideal option for professionals who need to split logs regularly. A single cycle will make light work of logs within 12 seconds, allowing you to quickly and efficiently make your way through a big pile of logs in no time. It even has wheels and attachments that allow you to move it around easily and tow it up to 45 mph. This log splitter comes with a two-year warranty, guaranteeing you good use out of it and showing you Champion's commitment to great quality products. It also has lifetime technical support, so even when the warranty runs out Champion will be more than happy to help you solve any issues. It has an auto return, further quickening the log splitting process. It does run on gas so you will need to be able to maintain this for continued use. See more information on Champion 100251. This is hands down one of the most powerful log splitters you will find anywhere. If you are looking for simple tasks, we suggest you save your money on something cheaper. If you are regularly splitting logs, this might be a better investment to save you a tonne of time. Despite the relatively low price point, this log splitter has an amazing level of force at 10 tonnes of horsepower. It operates using a hydraulic ram - however, the length of the beam is shorter than some other log splitters. This means you will need to be able to chop large logs down to be able to fit in the splitter. 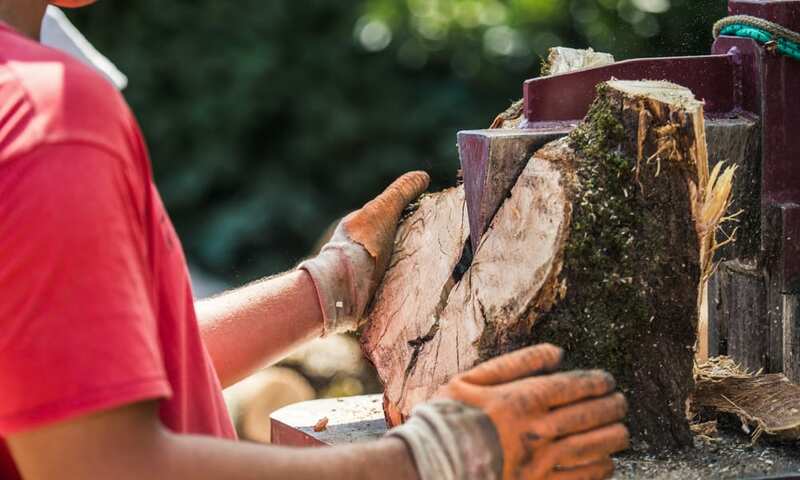 It is made out of a highly durable form of steel that will ensure the log splitter will last for years - with most customer reviews saying it likely lasts a lifetime. There is a cradle function which helps keep split wood in one place and prevents it from falling. This way, you can easily turn it after the first split and start again if you are aiming to cut the log into quarters. There are wheels on the bottom of the machine, making it very easy to transport and store away. The smaller size also means it will take up less room in your shed or garage, so is great if you only have a small space available to work with. See more information on Sun Joe LJ10M Logger Joe. If you are trying to save money, we do still suggest you spend a little extra and go with this machine. The extra power is worth the few extra dollars, and it is very easy and efficient to work with. This log splitter has a little bit less horsepower at 6 tons, however, has a longer beam allowing you to tackle larger logs and minimizing how much chopping you need to do beforehand. 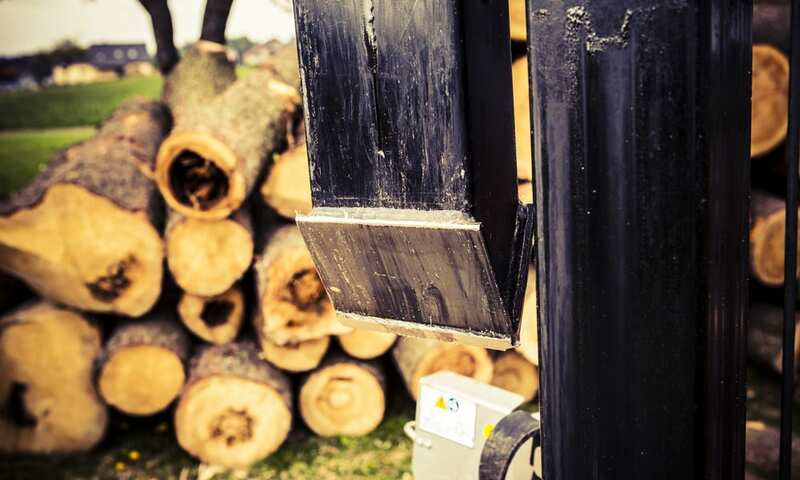 The 20.5-inch beam will carry most standard sized logs towards the splitter within eighteen seconds, helping you quickly and efficiently split them. There is also a stroke limiter function which allows you to shorten the cycle for smaller logs, saving even further time. It has two seven inch wheels at the back, and some rubber coated handles at the front, making it easy for you to move it around with minimal effort. It is streamlined to make sure it is more compact and will fit into your garage or shed with relative ease. As it is electric, it can also be stood upright to save further floor space. This has such great reviews that it has been awarded Amazon's Choice for log splitters, and is truly a fantastic product. See more information on Southland SELS60. This is another great budget option if you really do need a larger beam for bigger logs. It is also quite a wide machine, allowing you to tackle thicker logs without worrying about them falling off. If you are really on a strict budget, you can simply invest in a good ax to help you get the job done. This is a great option if you are only cutting a few logs per week, rather than going through them on a daily basis. We still suggest getting a quality ax for the job, and this option from Fiskars certainly fits into that category. The long handle means it can be used by tall and short users with relative ease, and it is well balanced to ensure powerful, but safe, hits every time. The blade itself is designed in a convex shape to make it easier to remove the ax from wood once you have finished chopping. Customer reviews are fantastic, suggesting that users are easily able to split logs in a single hit with this ax. It has been awarded Amazon's Choice for axes thanks to these great reviews and the quality craftsmanship. It comes with a lifetime warranty, giving you complete trust in the dedication Fiskars have to produce quality products that get the job done. If you must go with an ax, this really is your best option by miles. It is designed especially for splitting logs, and this goes a long way to make your job much easier than other axes would. This is another amazing heavy duty log splitter that provides 25 tonnes of horsepower, helping to split through even the thickest of logs in mere seconds. It can split logs both horizontally and vertically at the same time, or you can opt just to cut them in one direction. It is gas powered, so will need to be kept horizontal when stored and will need to be topped up from time to time. The Briggs and Stratton engine is very efficient and uses minimal gas per split. The beam is designed in a U-shape to maximize sturdiness and prevent any breakages. It also has a log spinner at the end, making it more efficient and causing less stress to the beam. The ram has an automatic return function, further speeding up the process and allowing you to operate the splitter single handed whilst in use. It is quite weighty but has wheels that allow it to be easily transported without too much effort required on your part. See more information on YARDMAX YU2566. Of the two priciest, professional grade log splitters this ultimately wins due to the small additional features that give it an edge over the other in terms of efficiency, speed, and durability. It does not, however, come with a warranty. If you are only working with small logs that are to be used for firewood kindling, this is another great budget option over getting an ax. This works by having a bar in the middle that you set a log on top of. You can then hammer the log down through the bar, which naturally splits them into kindling sized pieces. There are also rings at the top and the bottom to keep the logs safely in place and protect your hands from both the hammer and the blade. This option is made out of cast iron, meaning it will be very long lasting and sturdy. It is made in Australia, so is made under manufacturing and safety standards that exceed those of the United States. It requires no maintenance and no power source to work, so is also cheaper to run. The large bar requires less force than an ax would split logs, so if you struggle with axes this might be a good option to consider. See more information on Kindling Cracker Splitter. Though axes are a great option because they can be used for other purposes down the line, this is also a fantastic option if you really just need it to make firewood kindling. It is quick, efficient and requires no power source. If you struggle with crouching over or squatting, this is a great option as it brings the log splitter up to a workable height thanks to the included stand. It has been awarded Amazon’s Choice for log splitters thanks to amazing customer reviews and great quality. It provides around six tonnes of horsepower, making it a great mid-range option at a good price. If you prefer, it can also be used without the stand. There are wheels attached to the bottom, making it easy to move and store away. We suggest removing the stand whilst storing to save space, but it can be kept on without any worry about the durability of the stand. It runs entirely on electricity, which is great for the environment and much more cost effective than the gasoline run models. See more information on WEN 56207. This is a pretty good budget version of an electric log splitter and has some great features. For general use it is fantastic, but for the extended use you may need to invest in one of the pricier models. This is Yardmax’ cheaper option, which still manages to provide around five tonnes of horsepower when splitting logs. It also comes with a stand, which is great if you need to keep it at a certain height for comfort. It cuts logs of around 20 inches in length and 10 inches in diameter easily within the 16 second cycle time. It requires two hands to operate, although this is to make sure it is one of the safest options available. It has a smoke limiter, making it one of the more environmentally friendly options. The wheels at the bottom are easy to operate and make it very portable. The stand can be removed to save on space when storing - however, there are no bars underneath so you can also store things beneath it. See more information on YARDMAX YS0552. If you are looking for something that minimizes the impact on the environment but still needs something that can split the logs for you, then this is a good option thanks to the smoke limiter. It is also very budget friendly and has a good amount of horsepower. Though by no means a budget option, this is a cheaper version of Champion's full-sized log splitter and still manages to provide seven tonnes of horsepower. The extra price is more than justified by Champion's standard two-year warranty and lifetime technical support, showing you they are confident in the quality of their machinery. The wedge is made out of reinforced steel to make it the strongest, most durable wedge of the log splitters on this list (bar the other Champion splitter). It has wheels at the back and a small handle at the front to make it easy to store. Though it is gas powered, it can still safely be stored vertically to save space in your garage or shed. See more information on Champion 90720. If you want the power and quality of Champion products, but do not have the budget for the full-sized option, this is a great compromise. It will work through most log sizes but may take slightly longer on large logs than the larger splitter takes. As with anything you buy, safety should come first – and you should also be thinking about how long-lasting the product is. You want it to be able to effectively split logs without causing any harm to the user, and there are a few ways to make sure of this. Always read the product description thoroughly. This will highlight any additional safety certifications and features the product may have. For example, a product with a stand will be safer to use for someone with difficulties kneeling down. You should then read customer reviews. These will be a lot more honest as many customers will take straight to the reviews section if they have any grievances with the product. Click on the lower ratings, and read them to see whether or not the issue applies to you. If possible, get a product with a warranty. This protects you against damages made to the product within the period given. It also means the manufacturer is confident that their product is safe and will last for a long time. The longer the warranty, the better. There are two types of power input for log splitters – gas and electricity. Gas splitters are usually more powerful. The fuel allows them to run at higher pressures and speeds, and these are usually much more heavy duty than the regular ones. It does also mean they are more expensive. They are also harder to store as you need to be careful that gas doesn’t leak – although the newest models are usually fine for this. Electrical log splitters, in general, do not have the same speed and pressure as gas splitters. They are, however, much easier to store and more than adequate for small to medium sized logs. They are also much more environmentally friendly – especially if you can find one that reduces smoke. Axes and kindling splitters are manual, and therefore there is no need to worry about power inputs. They are also far cheaper if you are only needing to use them occasionally. Pressure is measured in tonnes of horsepower, and the higher the pressure the quicker it will manage to get through logs. More pressure also means an increased ability to work through thicker logs. Do not settle for anything less than two tonnes of horsepower, although machines do go right up to over twenty tonnes. If you are using it for general day to day tasks such as firewood, we suggest just going with the lower – and cheaper – models. If you are using it often, consider investing in the higher pressured models to help save you time. Log splitters help you split logs through the center, rather than chop them horizontally. This is useful when you are trying to build up a supply of firewood, as often logs that have been quartered are much more useful in a fire than full logs are, and it will be easier to fit them into the log burner or fireplace. Some woodworkers might also find log splitters handy for specific projects that require wood to have been cut in this manner, however, you should keep in mind that they will not cut the wood precisely at all. Most log splitters run on electricity and gas with a motor. You simply need to place the log at the end of the ram on the beam and let it push the log forward, allowing it to split. If you want to quarter the log, we suggest turning it at this point to make your job a little bit easier. Most modern log splitters have an auto return on the ram, so it is programmed to go back to its original spot once the log has split. If not, you usually just have to pull a small handle to bring it back to where it needs to be. There is usually a splitter at the end, which is in a narrow and pointy shape. The ram pushes the wood into this splitter, which places enormous pressure on the log. This pressure, combined with the focus of it being on the center, will cause the log to split in half right down the middle. This won’t usually be a clean split but is more than adequate for firewood. Kindling splitters work a little differently – with these, you simply place the small log on top and hammer it down until it splits. The concept is very similar, you just need to do things a little differently. Log splitters are very useful tools for dealing with newly cut logs. They help reduce them into more manageable chunks, which is great if you need firewood or want smaller pieces for woodworking. From gas and electric splitters to old-fashioned axes, the spread of products available is vast and daunting – but we hope this list helps you narrow down the options. Always go for safety and durability first, as these will ensure both you and the product will last long enough to get good enjoyment out of it. If you are only using it occasionally for household tasks like firewood, we suggest just going with one of the cheaper options as these will be more than adequate. Professionals, however, really should invest in a more powerful machine. This list mainly serves as a way for you to know what different kinds of products exist. We are sure you will be able to find the right product for you in no time at all! You can often buy extra splitter fittings for these. If possible, consider investing in a four-way splitter to help save you even more time. We hope you enjoyed our article on "10 Best Log Splitters in 2019", if so, please share and rate it.